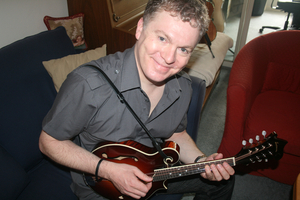 Yes, it’s my one year mandoversary — I’ve been playing the mandolin for one year! Well, to be completely accurate it’s been slightly longer than one year, but I didn’t have the time to write this post until today. A little over a year ago Sonya, my wife, suggested I get a mandolin. She thought it would be a great “challenge” for me. She was right. To be honest, I wasn’t all that keen on taking up the mandolin. I already had a lot on my plate with guitar, composition, production, engineering and the wall of business stuff I have to do each day. Yes I loved the sound of the instrument, but I wasn’t sure I wanted to make the time investment into the mando (BTW, that’s the short form for the mandolin). So I decided I would first rent a mando from a local music store. The instrument was, to be kind, horrible. Think of a cardboard box with old dead strings on it. That would have sounded better than the rented mando. But something resonated with me and don’t know exactly what it was. I suppose the short answer is I was bitten by the mando bug. And then I started down, what has been (and will continue to be) a very long path of trying to learn the mandolin. It’s a great path to be on — man I love the mando! There really is no substitute for time. You really do have to practice. And practice a lot. My teachers all told me that consistent, sustained practice was the key to progressing on an instrument. And they were right. I have a certain amount of facility on the guitar and I think that made me think that picking up the mando would be easier than it has been. I feel like my playing has leapt up on the mando over the last few months, but it was definitely frustrating in the beginning. The fact that I play every day for at least an hour has, in my mind, been the most important factor in my progress. Of course, there’s no one way to learn an instrument, but for me, taking a traditional approach to learning has worked very well. I work on scales, chords and sight reading in addition to learning pieces by Bach, traditional Celtic tunes and improv every day. The subheading pretty much says it all. A good mandolin, set up nicely plays like butter. To me, it seems like a good set up is more critical on the mando than on the guitar. The type of pick you choose to play on the mando is extremely critical. The material and shape of the pick will have a profound affect on the tone you produce. I went through a whole bunch of different picks and found that the Blue Chip TP-1R 40 works best for me. Well that’s about it! I’m sure I’ve learned more than I’ve written in this post, but I have to get back to practicing!